In order to get the most accurate readings from your monitor, you should make sure that you use control solution. Its purpose is to make sure that your meter is working properly and calibrated correctly. By not using control solution you run the risk of getting blood sugar readings that are not right. If you give yourself insulin based on a test result that is not precise, you could very well end up higher or lower than your target range. By using control solution frequently you greatly decrease the potential for unnecessary blood sugar fluctuations. Although it is recommended to use control solution weekly, there other times it is a good idea to use it. Control Solutions are made differently by each company and only work with meters of the same brand. 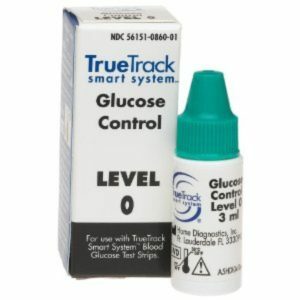 Make sure that the control solution you are using matches the manufacturer of you glucose meter and your test strips. It is also good to remember that each separate bottle has its own shelf life or “use by” date, and that the solution will not perform as desired after that period of time. By using control solution you can ensure more accurate blood sugar readings and better manage your diabetes. If you have any questions regarding control solution or diabetes supplies, please contact us.